Each of us has psychic abilities. In this one-day experiential workshop you won&apos;t just talk about them, you&apos;ll actually experience them! Learn how to identify your guardian angels and spirit guides by name, feel their loving presence, and receive guidance, inspiration, and healing from them. Discover your soul&apos;s purpose and hidden present-life talents. Retrieve all of your missing or fragmented soul parts. Experience two of your past lives and heal any residual karma from those lives. Also, learn how to give psychic readings to others, plus much more...Class space is limited, so register early. Ross J. Miller is a professional psychic healer, medium, regression therapist, and dream interpreter. For the past 25 years Ross has been guiding people worldwide through his psychic readings that include guardian angel communications, past-life readings, dream interpretation, soul retrieval, as well as aura (energy field) healing and the releasing of karma. 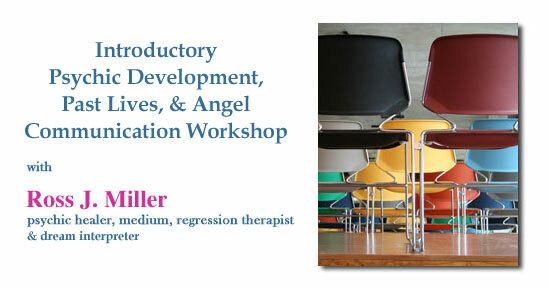 As a regression therapist, he guides people back in time (without the use of hypnosis) to the root causes of their physical, mental, emotional and spiritual problems. With the help of a host of spirit guides, angels and archangels, he quickly and easily releases these various states of dis-ease from his clients. His psychic readings and healing sessions can be done in person or by telephone. His practice is in Newton, Massachusetts. $175 (a $100 deposit is required to reserve your place). Please make out your $100 deposit check to: Ross J. Miller, and mail it to: Ross J. Miller, 1075 Washington St., Newton, MA 02465. Please write the workshop date on your check. The balance will be due at the workshop and can be paid by cash or personal check. If at the last minute you&apos;re unable to attend the workshop, your deposit will be credited either towards a future workshop, a psychic reading, regression, or healing session. The hotel prefers that no food or beverages be brought on site. I suggest that workshop participants eat lunch in the hotel&apos;s sports bar restaurant. The food is inexpensive but very good. Please complete the registration form below and email it to Ross, or call Ross at (617) 527-3583. Please remember to mail in your $100 deposit.